Previous: Sildenafil – What Is It And What Are Its Effects? Most informed people will tell you that getting dental implants is better than getting dentures, despite the slightly higher costs. The problem is that most dental insurance won’t cover or will cover only a very minimal portion of the whole implant process because in most cases, it is considered a cosmetic procedure. Depending on residence area and the extent of your problem, a single implant can cost anywhere between £1200 to £4500, while implants to replace an entire set or partial set of teeth can cost approximately £10,000 to as much as £25,000. For many people this will seem like too many zeros to contemplate, but it costs that much because it involves both a dentist and a surgeon to do it. Luckily, dental insurance plans are beginning to cover it, but the bad news is that the excess can be quite high alongside the higher monthly costs involved with the policy. Still, many people consider it a worthwhile investment than always having to worry about their dentures falling out and causing much embarrassment and discomfort. Below are some tips to help you find cheap dental implants. 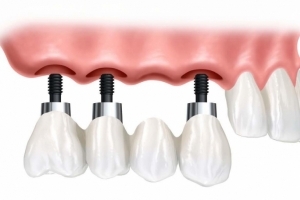 As dental implants are necessary dental work for most, it is important that you be able to find time to have them done when you need it and not have to put it off because you are unable to pay for it. You need to be able to find dental sites that can offer you a range of interest-free payments or extended payment options, as well as all major healthcare insurance plans so that you can have the treatments done when you need to or want to. You can inquire what type of implants your dentist would recommend for your needs and your budget. They may be able to offer a custom treatment plan which will address your dental issues without the expense of multiple implants. Some areas may be suitable for alternatives like dental bridges, which are a more cost-effective solution than multiple implants. If your current health insurance covers implants, you can ask them to give you an allowance that is equivalent to what normal bridges or dentures would cost. Make sure as well to find a dentist that participates in your health plan’s network to avoid paying additional out-of-pocket fees. Timing, believe it or not, can also help you avail of affordable dental implants, especially if you have a flexible spending account. Implants are expensive, but there are ways of reducing or spreading the cost if you take the time to investigate.